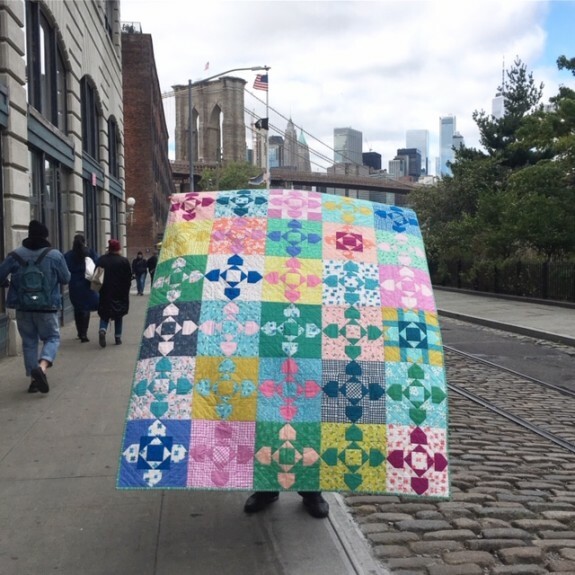 This finished Daisy Chain quilt may be new to you, but it doesn’t feel that way to me! I think I’ve had this quilt done for over a year and it’s just been sitting in a quilt pile waiting to make it on the blog. Today is the day that happens! 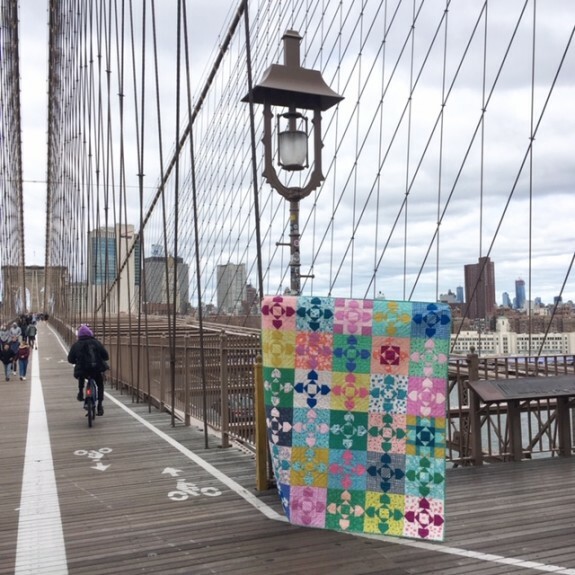 These quilt pictures were taken on the Brooklyn Bridge and in the neighborhood right next to the bridge, DUMBO. 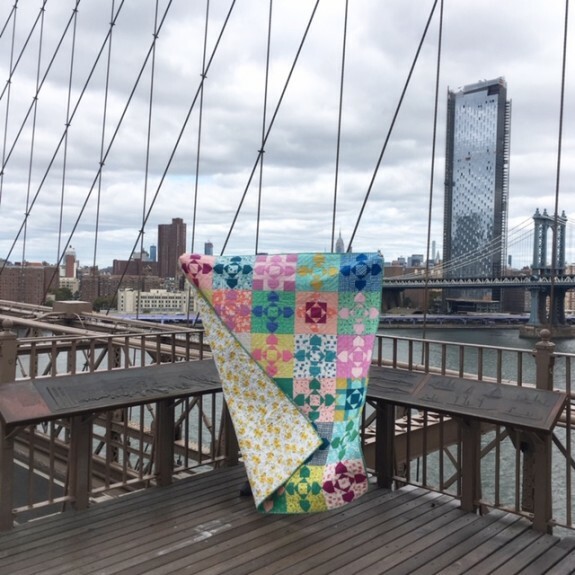 I’ve always wanted to take a quilt picture on the Brooklyn Bridge, but unfortunately it was a very cold and windy day in New York when I finally hauled a quilt up there and it was nearly impossible to get a good shot. 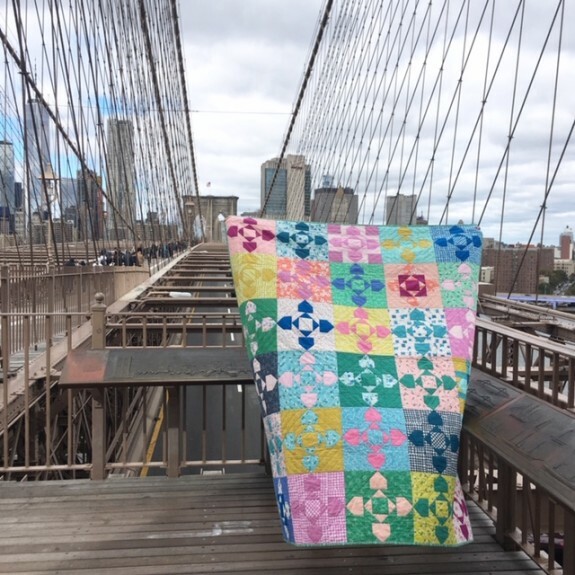 So we decided to walk around DUMBO and get some pictures there, too. 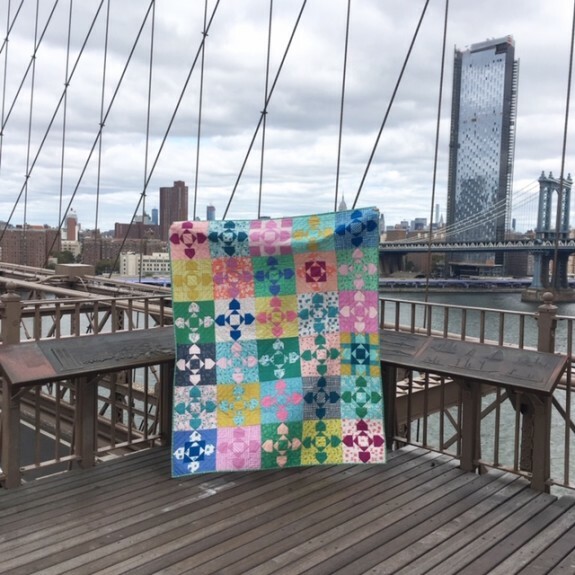 The fabric is Annabel Wrigley’s Daisy Chain collection from Windham. You can read more about the fabric and this pattern in my first blog post about this quilt here. Windham describes the collection as “a modern take on the vintage floral vibe,” and I would say that’s about right. 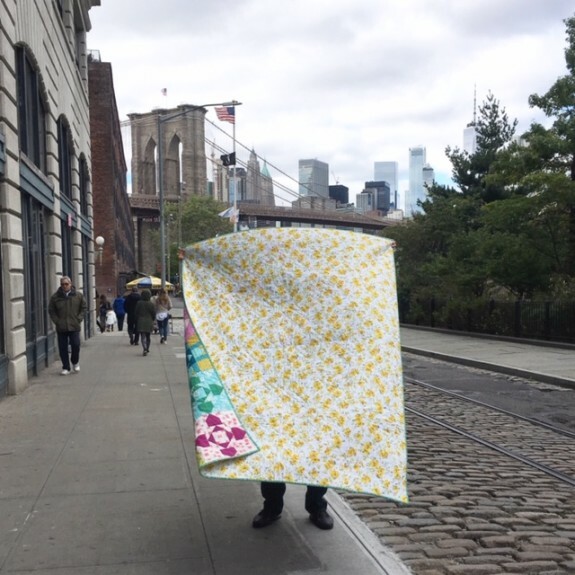 In fact, I was getting such a 70s vibe from the fabric I thought using a vintage floral bedsheet for the backing would be a perfect match, and it is! This sheet was discovered in a drawer at my parents’ house. It had never been used and my mom didn’t want it so I claimed it. A note about using vintage sheets: Most of them are a cotton/poly mix. That may turn some people off but I’m fine with it. I did pre-wash the sheet in hot water to make sure it wouldn’t shrink later. 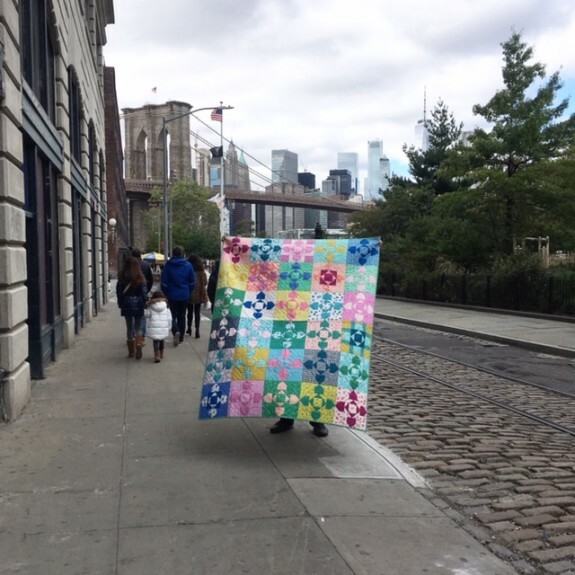 I have not washed the finished quilt yet but I don’t anticipate any problems. When you touch it you can tell that it has some polyester in it, but I find it weirdly comforting, in a way that reminds me of sleeping in cotton/poly blended sheets as a kid. In short, I recommend giving those old bed sheets a try. I’ve been slowly collecting them and one day will make an entire quilt out of old sheets. More on that later.